I've got a logfile available if needed. @micha-r I ran into some hiccups connecting to and passing the hotel's captive portal at a Home2 Suites last week. When I couldn't get it to work the first time from my iPhone, I connected to the teleport from my laptop and the hotel's captive portal finally popped up and let me enter my info to authenticate. I was able to get it working from my phone only on a different day (since Hilton makes you annoyingly re-authenticate every 24hrs)...but I think when I got stuck where you are at, I had to unplug the teleport, let it reboot and try again. You have to actually enter your info into the hotel's captive portal and get the success page before you'll be able to get past the "internet" green bubble on the teleport setup. Yes, please send the file to gunars.ritins@ubnt.com. @Micha-R, @Jeremy-Smith: we'll have an update soon that will improve guest portal compatibility. It was solved for Xfinity, but we think many other networks have the same behavior. I was wondering about this as a LOT of the Marriott properties have a captive portal you need to enter your room / name into before you get access. @Jeremy-Smith, @Joshua-Newton, @Micha-R: please update to the latest firmware via the app, and let me know if it works now. I'll be in a Marriott property next week and will test out. The new firmware for the teleport unit or mesh router? In any event, I'll be staying at a hilton hotel starting Dec. 11, so I'll be testing it then! @Joshua-Newton, @Jeremy-Smith: Please, use in-app updates when Teleport is fully connected to the router (green color text in the app). Yes, local network updates would be great. Will check development estimates again. 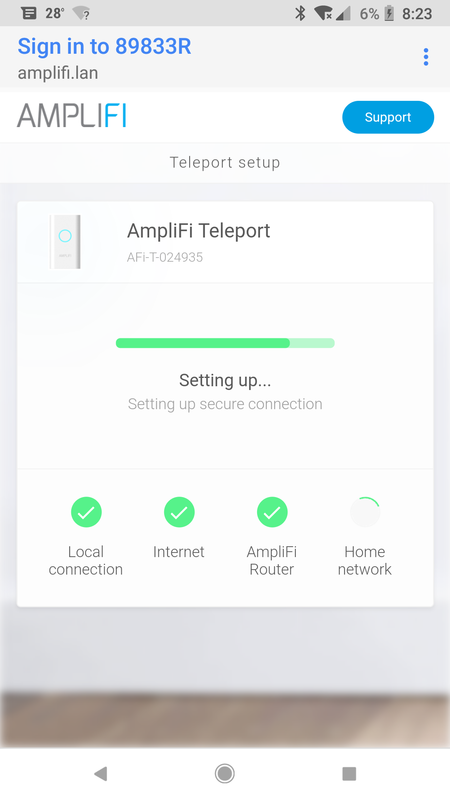 @ubnt-gunars JUST updated the Teleport firmware manually. However I'll make sure to no update from the App. Yes for honors I have to reset the Amplifi and connect through my laptop. It seemed when my lease was up it still thought it could do everything but the last step. It would just offer the "change connection" but even doing that didn't work. Could be the way Hilton blocks internet access until you renew your 24 hour session. I can't get past this screen without unplugging my device for an extended period of time. Then once I plug it back in, I get the captive portal again. I left it unplugged last night for a few hours while I slept.